The more people come to know the woodcock, the more they appreciate this unique bird. Naturalists seek out woodland openings in early spring to watch the acrobatic mating flights of male woodcock and to listen to the beautiful sounds they emit during their display flights and their intriguing ground calls. Some folks hunt woodcock in autumn, following flushing and pointing dogs while participating in a centuries-old North American tradition. Others marvel at the bird's intriguing life history, which scientific research continues to reveal. The American woodcock (Scolopax minor) is a shorebird that has evolved to live in upland settings, mainly in areas of dense young forest. Taxonomists place it in family Scolopacidae, a group of sandpipers with eighty-plus members distributed worldwide. A similar, larger species, the European woodcock (Scolopax rusticola), inhabits the British Isles and Europe. Because of where it lives, its oddball looks, and its various behaviors, the American woodcock has earned a host of folk names including timberdoodle, night partridge, big-eye, bogsucker, and mudbat. The most commonly used name, woodcock, reflects the bird’s preference for wooded areas. A woodcock’s plumage is an overall mottled russet and brown. The breast and sides are beige. Black bars run from side to side across the forehead and crown. The short tail is brick red and black, tipped with pale gray spots. A woodcock's color and markings help it blend in with the leaf litter and other debris covering the ground in its preferred young-forest habitat. An adult woodcock is 10 to 12 inches long, stands 5 inches tall, and has a wingspan of about 20 inches. The body is chunky, the neck is short, and the head appears large in relation to the rest of the bird. The wings are fairly short and rounded. Females, also known as hens, are larger than males: females weigh 7.6 ounces, on average, and males weigh 6.2 ounces. The female’s bill is 2.75 inches long or slightly longer, while the male’s bill is generally less than 2.5 inches long. The large, dark eyes are set well back and high on the sides of the head: This positioning lets a woodcock watch for danger in all directions – behind, above, and to the sides, as well as straight ahead. On the ground, woodcock mainly walk about, although they can scuttle along fairly rapidly where the cover permits it. When a woodcock flushes from the ground, air passing through the outer wing feathers produces a whistling or twittering sound. If a woodcock takes off from brush, it will dodge between limbs and branches until it gets in the clear, then level off and fly from 10 to several hundred yards before setting down again. When feeding, a woodcock probes with its bill into soft soil. Sensitive nerve endings in the lower third of the bill help the bird locate earthworms, its favorite prey. The woodcock is able to open the foremost third of its upper bill, or mandible, while the bill is sunk in the ground, helping it to seize worms and pull them from their burrows. The woodcock’s long tongue and the underside of the mandible are rough-surfaced for securing slippery prey. Earthworms, high in fat and protein, typically make up about three-quarters of a timberdoodle's diet. Woodcock also eat ants, flies, beetles, crickets, grasshoppers, and various insect larvae, along with snails, millipedes, centipedes, and spiders. An adult woodcock can consume more than its own weight in animal food daily. At times, woodcock may eat seeds of grasses, sedges, and weeds. Watch a woodcock probing for worms. Woodcock migrate back and forth between northern breeding areas and southern wintering grounds. In spring and summer, they breed in the North, from Atlantic Canada west to the Great Lakes area. In autumn they fly to lowlands from the Carolinas west to eastern Texas, with the greatest concentration of birds wintering in Louisiana and Mississippi. Woodcock migrate north again in February, March, and April, homing to the same areas where they were hatched. When migrating, woodcock fly at low altitudes, usually around 50 feet. They travel by night. At dawn, they set down in thick young forest habitat, where they rest and feed during the daylight hours. Woodcock migrate singly or in loose flocks of several birds. They generally cover 20 to 50 miles per night, although some individuals may move 300 miles in a single night. In the spring, males establish individual territories known as singing grounds: clearings in brushlands and young forest. Log landings, pasture edges, old fields, and the edges of woods roads and country lanes are prime sites. Singing grounds vary in size, but a quarter acre seems to be adequate. After claiming a singing ground, a male may drive off other males by flying at them while cackling loudly. Woodcock court in the dim light of evening and dawn. While on the ground, the male repeats a nasal, buzzing call most often represented as peent. After peenting for a minute or so, the male takes off and flies upward until he is 100 to 300 feet in the air. He pauses and hovers in a circle for perhaps half a minute. Then he comes spiraling or zigzagging back down, singing a liquid, warbling pee chuck tee chuck chip chip chip chip. After landing on the ground, he resumes peenting. In the evening, males may sing and fly for half an hour or longer, and when the moon is bright they may carry on through the night. Females seek out males on the singing grounds. During the breeding season, one male may mate with several females. Most breeding takes place from late February or early March into early May. A hen usually nests within 150 yards of the singing ground where she mated. The male plays no role in selecting a nest site, incubating eggs, or rearing young. Favored nesting habitats include brushy woods near water, lightly wooded hillsides above moist bottomlands, old fields with low ground cover, and shrub thickets. 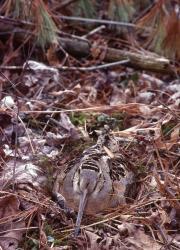 Hens start nesting in March, making woodcock perhaps the earliest nesters of all ground-nesting birds in North America. The nest is a slight depression on the ground in dead leaves. The eggs, usually four, are about 1 by 1/2 inches. They are well camouflaged: colored pinkish buff to cinnamon and covered with light brown blotches overlaid with darker speckles. Incubation starts with the final egg laid and lasts 19 to 22 days. If disturbed during the early part of her incubation period, the hen may abandon the nest. The longer she sits on the eggs, the less apt she is to desert them: toward the end of her setting she may hold tight even when touched by a human hand. Dogs, cats, skunks, opossums, raccoons, foxes, ravens, crows, and snakes are among the predators that may catch and eat hens or eat the eggs. Hens that lose their first clutch may renest, generally laying only three eggs the second time around. The eggs hatch from early April into mid-June. Woodcock eggs split lengthwise, unique among birds. Chicks are precocial – well-enough developed that they can leave the nest only a few hours after hatching. They are covered with down, pale brownish or buff in color and broken up with darker spots and stripes in a camouflaging pattern. 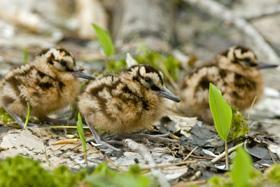 Chicks will freeze when a predator threatens or in response to their mother’s alarm call. The hen broods her young frequently, settling her body over them to shield them from rain and cold. Although woodcock hens nest singly, they may share feeding areas with other hens and broods. At first, a hen finds food for her young, but after a few days the chicks feed themselves. After two weeks the young can fly short distances, and at the end of four weeks they are almost fully grown, fly strongly, and look like adults. The family breaks up when the young are six to eight weeks old. If a woodcock reaches adulthood, its life expectancy is about 1.8 years; banded birds up to 7 years old have been recovered. Woodcock are hardy, and seem able to heal following injuries that would kill most other birds. Woodcock perish from accidents, many of which happen during nighttime flying. Predators seize them, including hawks, owls, and weasels. 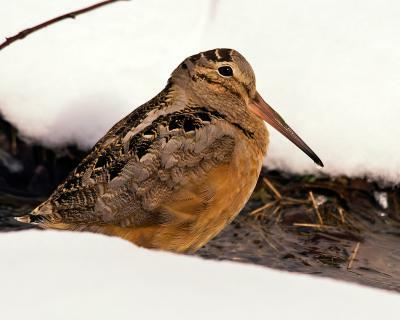 Some woodcock die during bad weather, when individuals returning north in spring get caught by snowstorms and hard freezes that seal off their food sources. Hunters harvest around 1.1 million woodcock each year, placing the American woodcock among the top ten species of migratory game birds taken in the Atlantic and Mississippi flyways. Over the last 50 years, the woodcock's population has fallen. Scientists, conservationists, and habitat managers are working to reverse that trend by creating young forest in regional habitat initiatives set up across the woodcock's range.